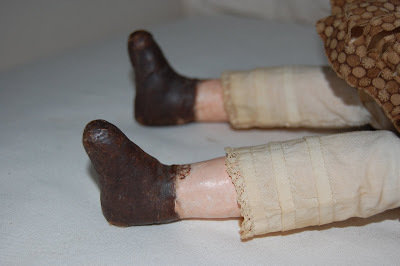 Occasionally I get emails from people who have antique dolls that they think are Izannah Walker dolls. 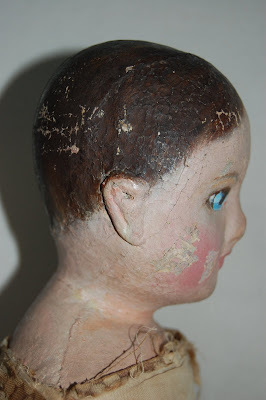 Sometimes they have a very nice antique doll, as was the case last year with someone who has what might be a Presbyterian doll. Recently I received an email from someone asking if they might have an Izannah Walker doll, but this doll has blue eyes. I asked for them to send pictures, which they did. 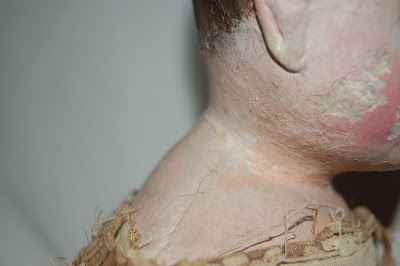 After looking over the pictures she sent me, I think she has an Izannah Walker doll that has seen extensive repainting and some helping in other ways. But the doll retains enough of the Izannah hallmarks that I think she is an Izannah doll. Of course, seeing the doll in person would give information that pictures don't. But what do you think? If you have ideas, please email me. I asked permission of the owner to post the pictures here on the Chronicles. What do you think? Email me or comment below. I agree that she's probaby an original who's suffered a loving repaint. I bet there's a lot of them out there. I've got to agree that it's hard to tell from the photos alone, but she probably is a Walker doll. When compared with my two, her eyes look too far apart, but some of that could be the repainting. Her thumb looks a little funky too and the whole hand appears a bit too "mittenish". Maybe a replacement or maybe just too many layers of paint??? Do you have any measurements or weight for this doll? Hmm. The thumbs appear different and the head shape too. But from the side it appears to have that downward gaze. Its quite possible an original. The eyes need to be brown and that could be throwing the whole look off. 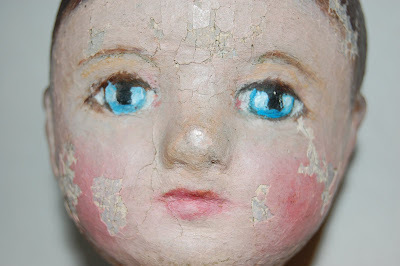 The eyes have definitely been repainted - perhaps by the ghost of Martha Chase? I think the hands have had some kind of filler added to them as have some other spots - and yes, way too many layers of paint. 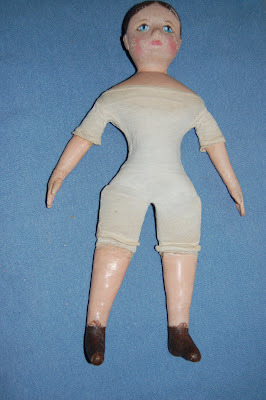 I've seen another Izannah doll that had been heavily repainted in the hands area that looked a lot like this. I wish I could see this doll in person and inspect her. But it's been a mystery. 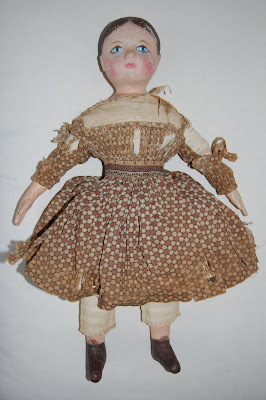 I can't help you to identify her as an Izannah Walker, but I can tell you that she's definitely not a Presbyterian Doll. She has none of the hallmarks of the Presbyterian, so that may help you in a process of elimination.